The New DIFC Markets Law Regime – A Catalyst for NASDAQ Dubai? Over the period of nearly two years the Dubai Financial Services Authority (DFSA), being the regulatory authority of the Dubai International Financial Centre (DIFC), has undertaken an extensive internal and external consultation process in relation to proposed changes to the DIFC Markets Law (issued in 2004), Offered Securities Rules and associated rules and regulations. The main aim of such a process was to bring the DFSA’s capital markets laws, rules and regulations into closer alignment with the European Union’s Prospectus Directive (2003/71/EC) and Market Abuse Directive (2003/6/EC) and various capital market standards adopted by the Organisation for Economic Co-operation and Development. All of the changes referred to above (“New Regime”) came into force on 5 July 2012. Going into a detailed review of all of the changes brought about by the New Regime is beyond the scope of this article (although we would be pleased to provide specific advice regarding any aspect of the New Regime). The focus of this article is to consider the impact of the New Regime on the following questions in the context of an offer of securities regulated under the New Regime: (i) when is a prospectus required? ; and (ii) if required, what information should a prospectus include? It is important to note that an offer of units in a collective investment fund is subject to separate considerations which are not covered by this article (and references in this article to “securities” do not include such units). having securities admitted to trading on NASDAQ Dubai. Whereas the previous definition of “offer of securities” referred to “offers” and “invitations” directly or indirectly targeting investors, under the New Regime an “offer of securities to the public” takes place if there is “a communication to any person in any form by any means, presenting information on the terms of the offer and the securities offered, so as to enable an investor to decide to buy or subscribe to those securities (…)”. This broad definition has been narrowed down by certain exclusions. For example, communications made in connection with the trading of securities that are listed and traded on a regulated exchange and in the ordinary course of business of an authorised firm or recognised member are not considered to constitute an offer of securities that requires a prospectus. offers directed at fewer than 50 persons (and where no such persons are natural persons) in any 12 month period. Under the old regime, if securities had previously been offered by way of a prospectus, no subsequent (secondary) offers of those securities were treated as new offers requiring a further prospectus. However, under the New Regime, any subsequent offer of securities that had previously been offered to the public will be considered as a new offer and the issue of whether a prospectus is required or not for that subsequent offer must again be assessed by reference to the definitions of “offer of securities” and “exempt offers” contained in the New Regime. reasons for the offer and the proposed use of proceeds. A prospectus issued under the New Regime is valid for a period of 12 months from the date of its approval for the purposes of making an offer to the public or having securities admitted to trading, provided that it contains all relevant information. There are restrictions on the extent to which historical data can be included in any prospectus (for example, financial information cannot be older than 18 months from the date of the prospectus). Further, if there is a significant change in, material mistake or inaccuracy affecting any material contained in a prospectus, or if a significant new matter arises during a prospectus’ validity, then a supplementary prospectus is required to be produced. Whereas before there was no formal prospectus approval process, under the New Regime a prospectus undergoes a formal approval by the DFSA. the issuer has received all the necessary consents as required under the New Markets Law and the Markets Rules. Of course, the approval of a prospectus by the DFSA does not mean that the DFSA accepts any responsibility for the accuracy, comprehensiveness or merits of the information included in the prospectus. The responsibility for the contents of a prospectus will remain with the issuer and/or advisors and experts responsible for verifying statements in the prospectus. The issuer may file a draft prospectus with the DFSA for an informal review to avoid approval delays upon the actual submission. Should the DFSA not approve the prospectus, the issuer can appeal the decision to the DFSA’s Regulatory Appeals Committee. In a public statement, Ian Johnston, Chief Executive Officer of the DFSA said: “These changes bring our markets regime into closer alignment with the EU requirements while retaining features necessary to accommodate regional needs and circumstances”. From these changes, it is clear that the DFSA is committed to making a continuous effort to ensure its legislative and regulatory standards follow best international practices. However, it will be interesting to see whether these changes will result in increased capital markets activity in the DIFC. 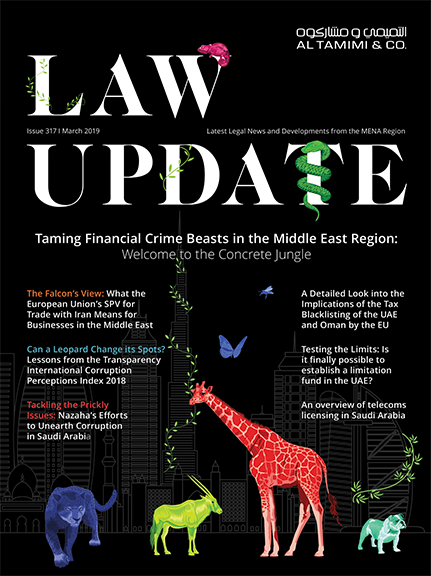 For more details, please see: www.dfsa.ae/LegalFramework/Legislation/AmendmentstoLegislation and/ or contact the author of this article.